A 5-Megawatt farm in Cleveland County. The capacity of Strata`s proposal for Duplin County would be 20 times larger. A North Carolina renewable energy company says it plans to build a large solar farm in Duplin County. Strata Solar announced yesterday it's developing 400 acres of land for solar panels with a capacity of 100 Megawatts. 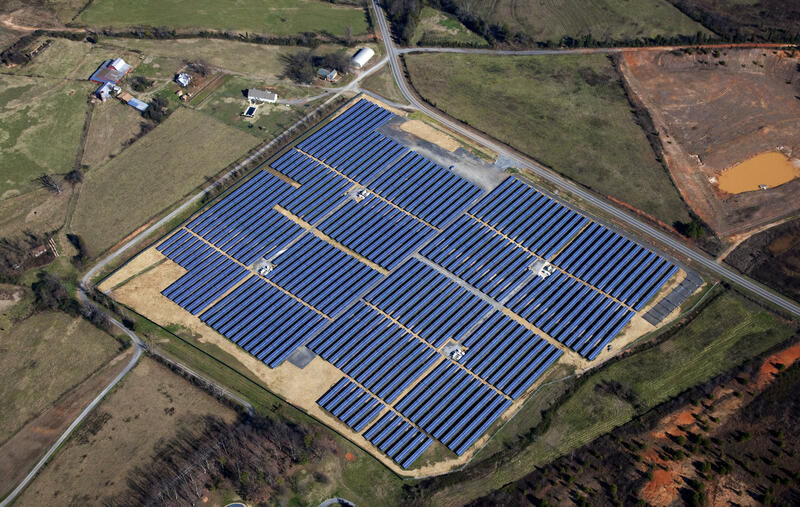 It's one of the largest solar farms in production on the east coast. Strata CEO Markus Wilhelm says his company will file its plans with the state Utilities Commission by the end of the month. "We feel highly confident that we can start construction toward the end of this year," Wilhelm says. "And while the project is going to be under construction for 12 months, it's going to end up to be a showcase that is very unique and has never been done before on the east coast of the United States." Wilhelm says the company plans to finalize a contract with Progress Energy soon. He says construction will cost around $200 million and the farm will provide enough energy to power about 12,000 homes. Solar energy industry leaders are gathered in Raleigh for a 5 day national conference. It's the 40th year for the National Solar Conference held by the American Solar Energy Society. This year it's being held at the Raleigh Convention Center. The public is invited to the final day of the conference this Saturday.